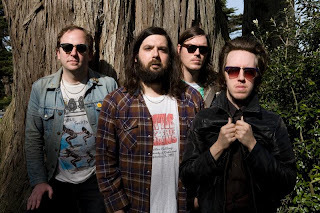 With their first release on Captured Tracks (and seventh official offering in less than two years ofexistence as a band) San Francisco's The Fresh & Onlys have completely shed the shackles of the "garage rock" pigeonhole (a set of handcuffs which never fit them particularly well). From the eruption of feedback that introduces "Diamond In The Dark", the Onlys announce that something new is afoot. Anthemic rock'n'roll that only mid 90's Guided By Voices or maybe the early Who were capable of. Big statements without studio trickery. "August In My Mind" saw a March 2 release.